The images you see here were taken on the various sets of Irwin Allen's television series Land of the Giants around 1969. 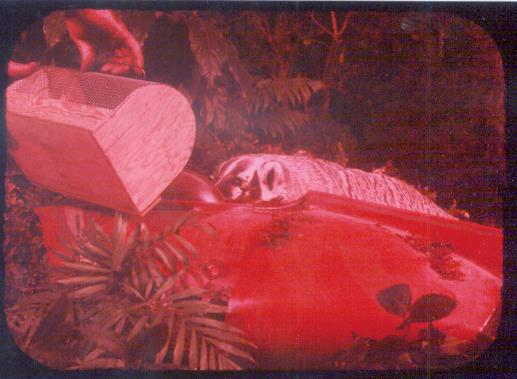 These are original 35 mm film clips, so original they don't even have the soundtrack added to them yet (the vertical black and white wavy lines usually on one side of a filmclip), which explains why they are so RED. 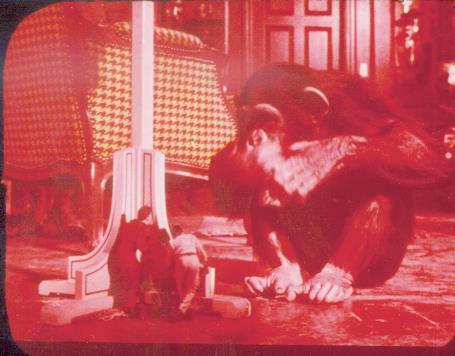 In the 1960's Twentieth Century-Fox used DeLuxe Brand film stock which, collectors have over the years sadly discovered, turns all but the darkest colors in the images a dismal shade of scarlet. However some of these pictures are so rare that to ignore them because of this would be a shame and a great loss to Giants fans. Picture one is from the opening of every first season episode. 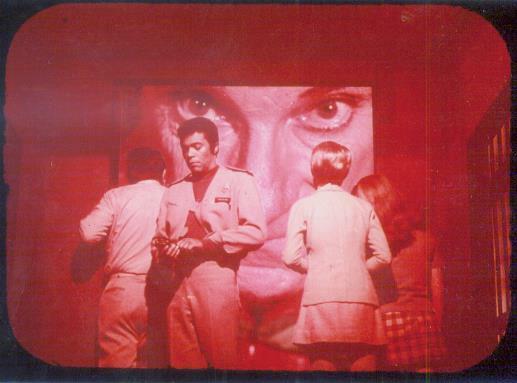 Although they were cut from the DVD sets released, all three of Allen's ABC television series (also including The Time Tunnel and Voyage to the Bottom of the Sea) utilized these openings. 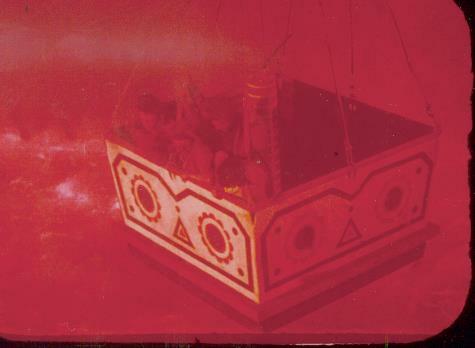 Picture two is a special effects shot from the "Land of the Lost" episode of the Spindrift crew adrift in a giant's balloon. 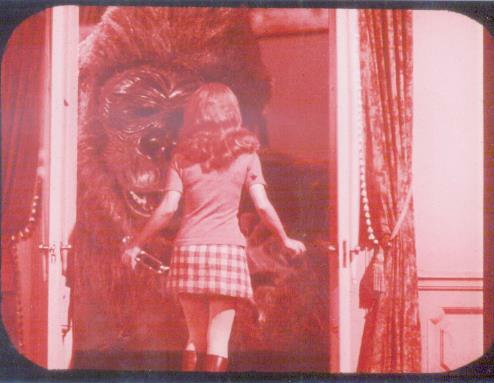 Picture three is from "Comeback" of Valerie (Deanna Lund) in a Fay Wray-like pose in front of Janos Prohaska wearing one of his unconvincing gorilla suits. 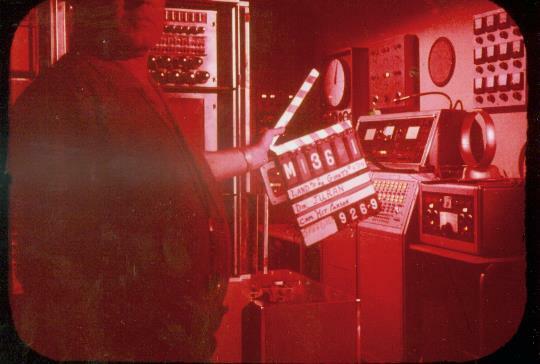 Picture four features an incredibly rare shot of the camera crew about to roll on the Spindrift engine room set from the "Nightmare" episode (originally titled "The Delta Effect"), and if you look closely you can see the episode production number (4714) and the director's name (Nathan "Jerry" Juran). 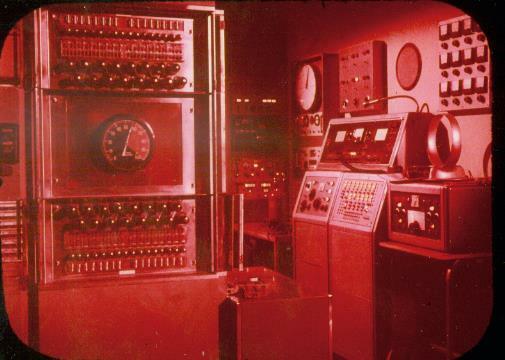 Number five is the engine room minus the technician. And number six reveals the surreal set created for Steve's hallucinatory adventures also from the same episode. 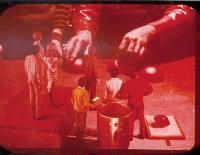 Actor Gary Conway's in the shot but with his red uniform he's hard to see. Pictures seven through eleven are all from the episode "Pay the Piper." 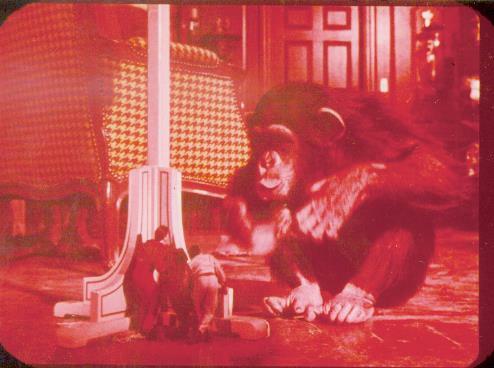 The first three are typical on-set and special effects shots but pictures ten and eleven are an interesting look into how television shows featuring animals were made in those days. 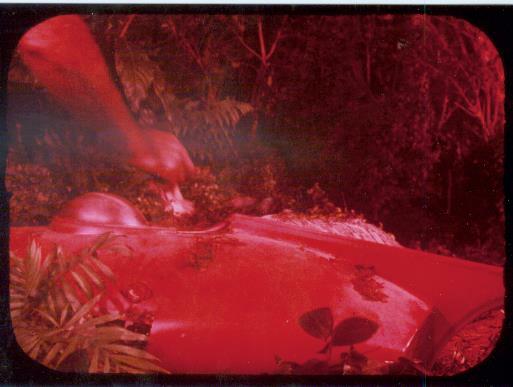 In this scene the live badger is supposed to attack the Spindrift model but on this day in 1969 it appears the handler wasn't having much success. In number ten you can just see the badger's back behind the spaceship and the handler's arm dangling a tasty treat in an attempt to get the animal to move closer. Apparently this didn't work either-in picture eleven he's holding a cage as a lure-probably with some small frightened animal inside! 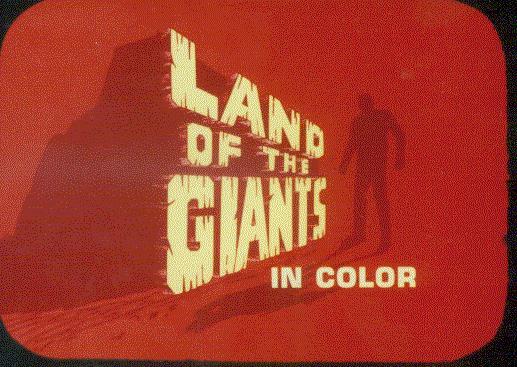 Speaking of "Piper," there is an interesting anecdote involving this episode relayed to me by my friend John Lyle Campbell and reprinted verbatim here: "One of my best friends is a retired set costume person who worked as the Set Costumer for season two of Land of the Giants. 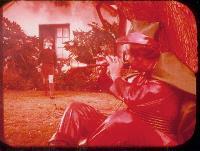 The day Jonathan Harris was doing that episode, my friend was putting on the final touches outside the set when all of a sudden, Michael Sarne, directing that X-rated flop "Myra Breckinridge" strolled over to Jonathan along with his large group of assistants and just started staring at Jonathan in that green Pied Piper outfit then announced, "I have a brilliant idea! Sir, would you consider appearing in my film? I'm Michael Sarne the director." 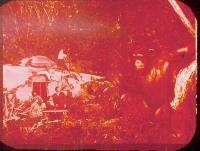 Jonathan responded by stating he was presently employed by Irwin Allen productions. "However if you want to call my manager and discuss the role and, most importantly, the amount of money involved, I will take it under consideration." Sarne replied, "Oh no, I'd just want you to make a cross in the background of this party scene in that wild outfit." Jonathan hit the roof: "How DARE you approach me to do extra work! I've been on the stage in New York for years and worked on HUNDREDS of film and television shows. What IDIOT gave YOU a directing job? How dare you come over and bother me while I was preparing to get into character! Begone, booby! Never approach me again!" The next day Irwin had Fox security go over to the "Myra" set and tell them Irwin's sets are closed sets, NO VISITORS, and we don't want to find any of this crew wandering around he studio. 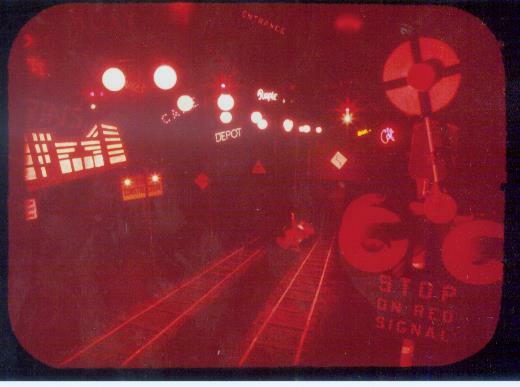 We don't care WHO you are, stay on your assigned sound stages!" 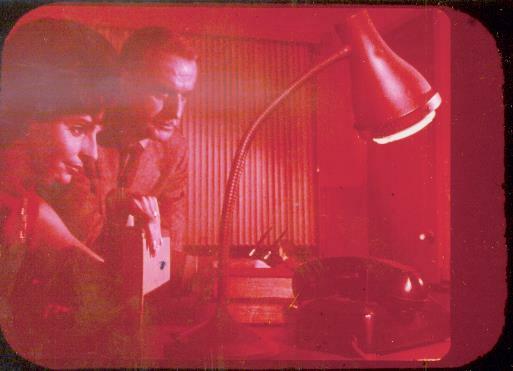 Picture twelve is a matte shot from the "Deadly Dart" episode featuring guest stars John Dehner and Madeline Rhue. This episode was originally titled "The Retaliator" but was changed before broadcast. Pictures thirteen through fifteen are from the "Doomsday" episode of Pedro the chimp in various special effects shots. Researching this article I discovered that no less than four different episodes featured giant apes! 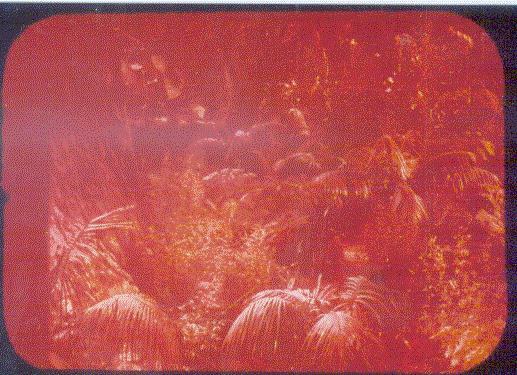 Image sixteen, as far as I can tell, is just a shot of the giant forest from season two. 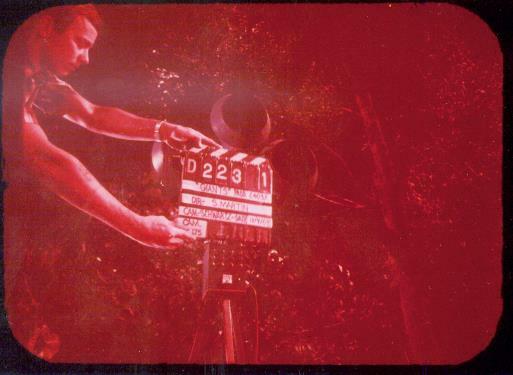 In image seventeen a tech holds the clapboard as the cameras get ready to shoot the first season episode "The Trap." Again, note the episode production number (2403) and the director (Sobey Martin).